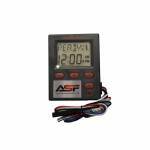 The All Seasons ASF automatic Feeder timer works with all single motor deer and auto fish feeders. 2 wires connect to the motor and 2 wires to the battery. Operates on a 6v or a 12v battery 1-6 feed times per day Adjustable 0-30 second feed time Test Button Battery level indicator 1 year warranty ..
Only for the AquaPro or Stren automatic Fish Feeders (2 Motors) Programmable digital timer schedule up to 6 feedings a day Customize feeder run times between 4-90 seconds Built-in battery level monitor Installs quickly and easily Replaces the LPAD Control Unit 1 Year Warranty This timer has 6 leads and the wiring harness. 2 leads for the upper motor, 2 leads for the lower motor and 2 leads for the battery. Just unplug your old timer, and plug this one in. 3.5" x 3.5" x .75" If your fe.. 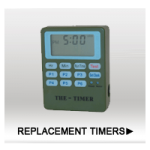 Replace your 6v or 12v feeder timer unit with this easy to use replacement timer. Set up to 6 feed settings per day. The unit will allow for motor speed adjustment of 50%, 75%, or 100% power. This has been robotically built for dependability. The PC control board is of military grade. Assembled in USA. 6v or 12v operation 1-6 feedings per day 1-30 seconds per feeding Motor Speed Control (50%, 75%, 100%) ..
THE-TIMER TWO-STAGE is a replacement timer for any feeder that runs two motors, such as fish feeders. 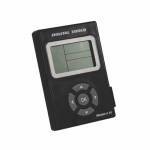 Easy to operate with a FIVE-year warranty and compatible with any 6 Volt or 12 Volt control unit. Can feed up to six times a day. Fuse protected. Two-motor wiring harness, extra pigtails, and AA batteries are included. 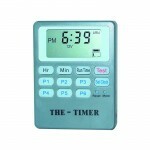 Replaces OEM timers on Texas Hunter Products and Sweeney Fish Feeders. .. 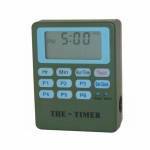 Simply the best deer feeder timer on the market. Easy to operate with a 5 year warranty. 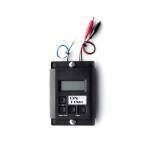 Compatible with any 6 or 12 volt control unit. Can feed up to 6 times a day. Fuse protected with easy 4 wire hook up, 2 to battery, 2 to motor. Wiring harness is included ..